I…just can’t even imagine a BBC Sherlock being done any other way. I mean, this is definitive–it is *definitely* the best choice to have made, and I’m one of the ones who adores that he’s not very nice and kind of a jerk, but still has all these depths of complexity that make a character so interesting. I’m sorry you can’t make 221b Con! I can’t either, but I’m hoping it catches on so I can make it next year. Well, I’m old enough to have started with Basil Rathbone movies on the telly and I still think Jeremy Brett is the most definitive canon Sherlock Holmes (rather like Joan Dixon’s Miss Marple and Suchet’s Poirot), but Cumberbatch has totally captured the character in a modern setting. He’s got the mannerisms from the original stories, the original enthusiasm of Sherlock Holmes, the internal conflicts and the hunger for true friendship (and a post on this is in the works by this weekend). 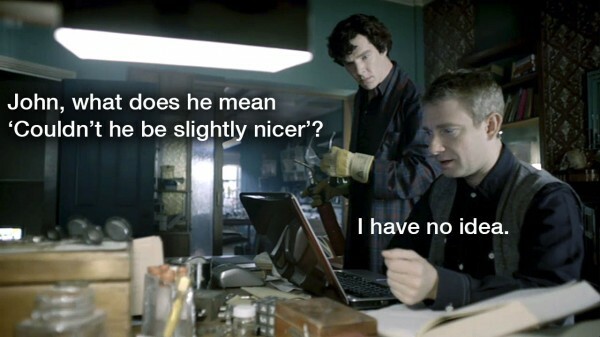 I look at all the other attempts to make Holmes “nicer” and it just doesn’t work. I believe Robert Downey, Jr. and Jude Law play beautifully off each other and captures a lot of the “Boy’s Own Adventure” of much of the canon, but miss the rationalism and scientific anchor of Holmes, while others seem to focus on the “mature rational Holmes” and miss the adventurousness and wit of the characters. I held on to my hotel reservation until April 1st when taxes (and a fabulous online class I’m taking called “The Beginner’s Guide to Irrational Behavior”) made me realize that it would be wiser to save the US$1,500-2,000 it would cost me to attend 221B Con and apply it to my UK trip to see Season 3 Sherlock, Christmas in London, and Hogamany in Edinburgh. I for one couldn’t envision anyone else breathing life into Sherlock Holmes set in this day and age but Benedict Cumberbatch. He takes you on the journey of his character-of looking through a prism and turning it round to see the possibilities and choices that challenge him. You watch his characters’ reactions to other characters-change, go back, and change again-like testing the waters-just like a “real person”. You watch him “grow”. The other characters John Watson, Mycroft,Greg Lestrade, Mrs. Hudson, Molly Hooper, Mike Stamford, they form his “family”. And we know how he reacts when anyone threatens a member of that inner circle. We should all be so blessed. Thank you Steven Moffat, Mark Gatiss for holding on to your selection of actors. Totally agree, Elizabeth. Benedict Cumberbatch makes the character so real, you completely forget you’re watching video. And, of course, it helps that the rest of the cast are excellent, and just the right choices as well. Cumberbatch and Freeman take the script and draw you completely into the story and out of yourself the way a very well written book does.